Movie Poster Art Gallery: Original Travel, Sports, Historical posters. The stage show ran at the Victoria Palace Theatre from the 4th October 1973 to March 1975. 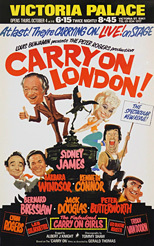 Essentially an old fashioned variety revue, it featured popular sketches from the film series. 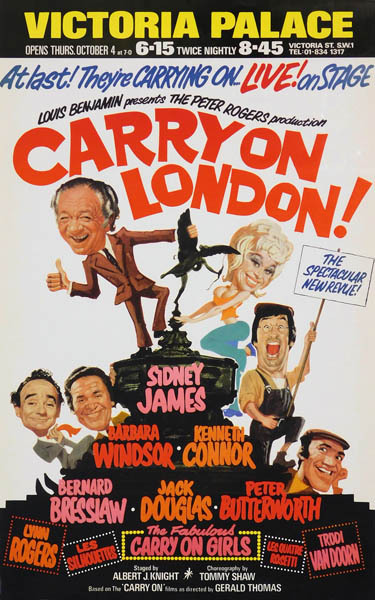 The artwork is very much in the style of the Carry On film posters and, therefore, may be by Eric Pulford or Renato Fratini. Original General Post Office (GPO) poster, 26"x36". 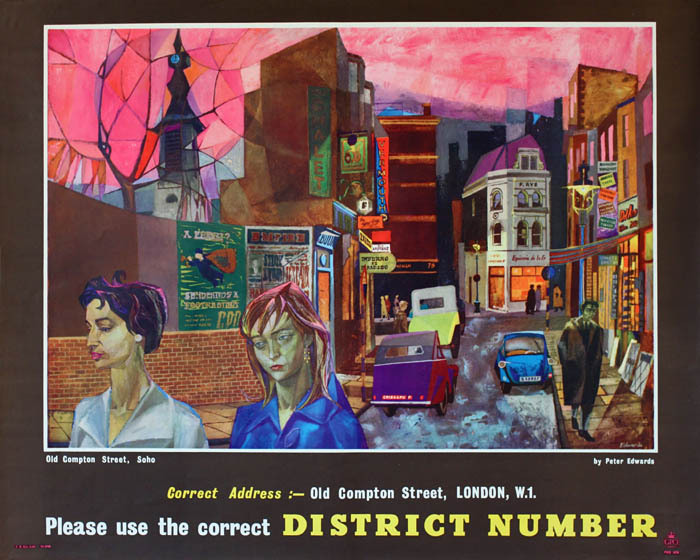 This poster's fascinatingly detailed artwork - a time capsule of Soho in the era of Colin MacInnes's 'Absolute Beginners' - shows Old Compton Street approaching the junction with Wardour Street, with the tower of St Anne's church beyond a bomb site. Visible are shop signs in Greek, Italian and French, and historically identifiable businesses, such as the white fronted French grocery shop, the Heaven & Hell coffee bar ('Inferno e Paradiso'), 'Going Gay' Jewelery, La Tosta restaurant, and The Swiss Hotel and Tavern. The hungover-looking figure on the right bears a distinct resemblance to the painter Francis Bacon, for whom Soho was a bohemian playground - Daniel Farson wrote of Bacon's "mornings when he was grey and nearly sightless from fatigue after drinking and gambling through the night". Original Motobécane cycles poster, 10"x24.5". 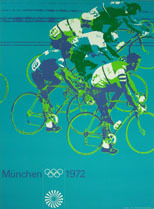 Wonderful poster for Motobécane cycles, ridden by team BIC who won the Team Classification that year. Pictured is BIC's rider Luis Ocaña, who famously crashed out on the Col de Menthé when leading eventual winner Eddy Merckyx. Ocaña went on to win the Tour in 1973. Salem Armory, Oregon, closed circuit TV broadcast. 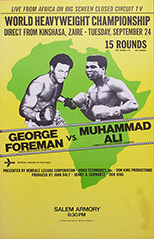 Original U.S. card stock poster, 13.5"x22". 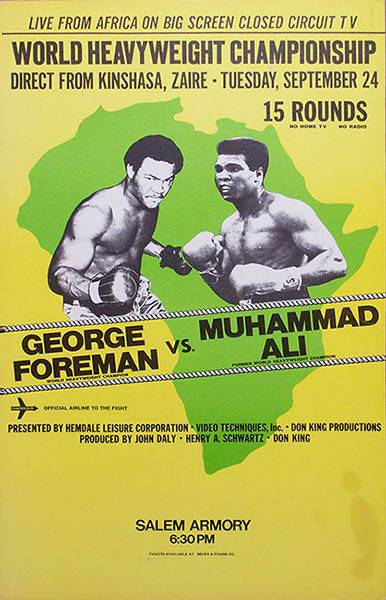 The poster features the originally scheduled date of Tuesday September 24th (Weds 25th in Zaire), but due to a cut Foreman sustained in training the fight was put back to October 30th (29th in the U.S.). Otl Aicher (1922-1991) was an internationally acclaimed graphic designer. His 1972 Olympic campaign is one of the landmarks of graphic design applied to a single event. 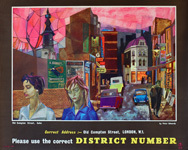 This is the scarce larger format version, printed for display at the Olympic venues, in superb condition. 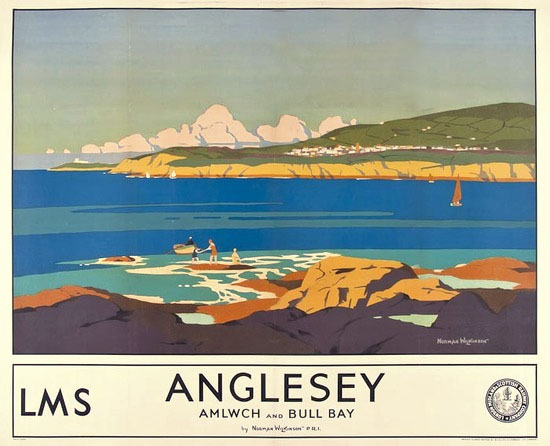 Norman Wilkinson was one of Britain's greatest poster artists. During World War I, he was the inventor of "dazzle painting", designed to disrupt the visible target presented by ships to submarines. 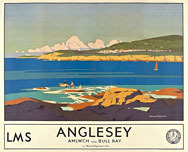 This poster shows the influence of Japanese print techniques, with Wilkinson's use of simple blocks of colour creating a magical vista of sun-washed sky and sea. Original British Railways and Bord Fáilte Eireann poster. Art by David W. Burley, printed by The Baynard Press. 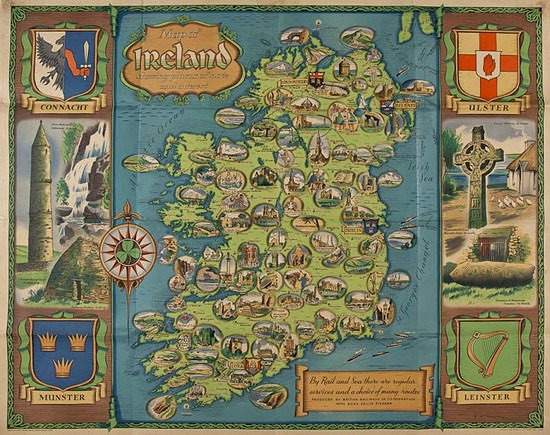 Full size poster created as part of the newly formed Bord Fáilte's push for greater tourism into Ireland. David Burley (1901 -1990) studied at Goldsmiths College of Art in London, after which he joined Southern Railway as an in-house artist. 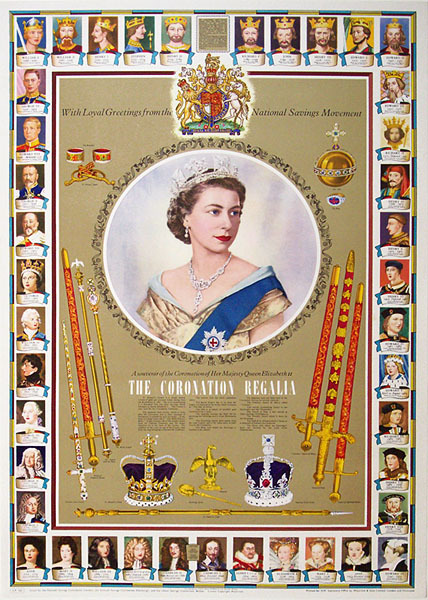 Original H.M. Stationery Office poster, 30" x 20". 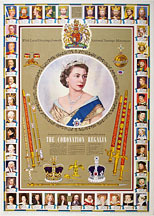 Richly colourful poster printed by the National Savings Movement to celebrate the 1953 coronation. The border features portraits of all England's previous monarchs. Design by Edward McKnight Kauffer. 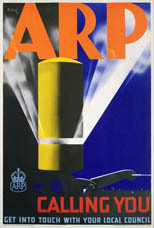 Edward McKnight Kauffer was one of the major graphic artists of the 20th century. 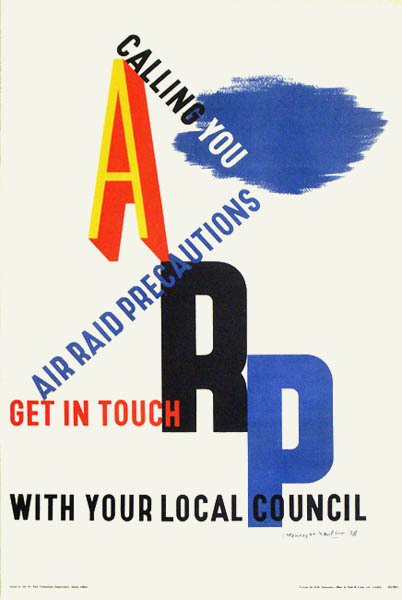 Issued by the Home Office's Air Raid Precautions Department. In the collections of the V&A and The Museum of Modern Art, New York. 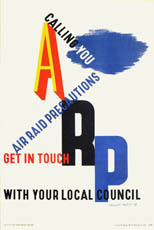 Pat Cockayne Keely was an inspired graphic artist who, along with his extremely bold designs for wartime commissions, produced posters for London Transport, Southern Railway and the Post Office. 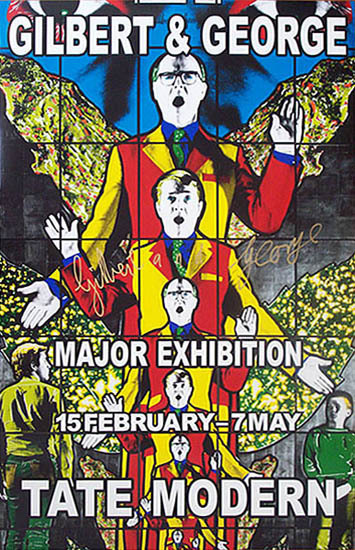 Original exhibition poster.Signed by Gilbert and George. 30" x 20". 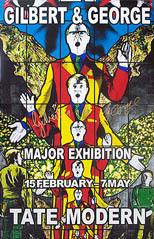 Limited edition poster from Gilbert and George's major retrospective at the Tate Modern Gallery, London. The exhibition was the largest retrospective of any artist to be held at Tate Modern.